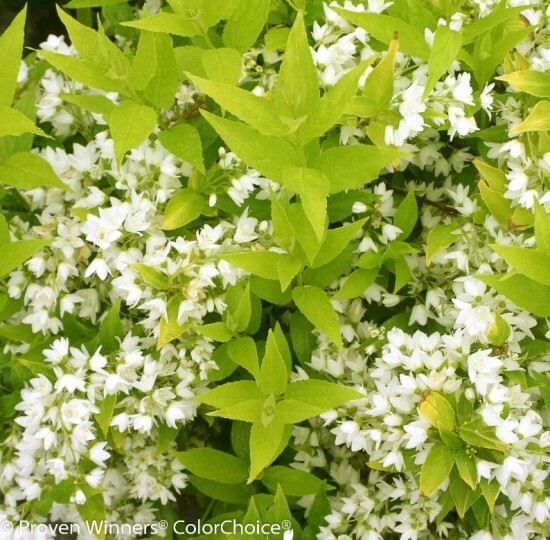 The attractive lime-yellow foliage of Deutzia 'Chardonnay Pearls' provides colour before the numerous pearl-like buds burst into attractive star-shaped flowers in spring. When the flowers have faded, this plant continues to shine until the end of the season with its glowing chartreuse foliage. Growth is strong, but compact making it a wonderful small shrub that is equally at home in the shrub border as it is in a perennial garden. Deutzia prefers well-drained, evenly moist soil. Prune to shape immediately after flowering. Deutzia blooms on the previous year's growth known as old wood. In late winter or early spring, cut away dead stems or stems that were broken over the winter. Do not prune until after blooming has finished or you may be removing flower buds. After flowering is finished cut back stems to the strongest buds.